So, I read a lot of blogs. I got hooked back in college, and while the titles I read have changed (several times) since then, one thing has remained pretty constant. I still love blogs. There's just something about a peak into someone's life... it's like reality TV but better. Way better. I thought I would share a few of my (current) favorites with you. You're welcome... and I'm terribly sorry about that free time you once had. The Pioneer Woman: Everyone follows this blog. Okay, maybe not everyone, but Ree is probably one of the most recognizable bloggers out there. This was the first blog I ever followed- great pictures of her ranch, awesome recipes, and a good dash of silliness, too. Camp Patton: This is my "I'm having a bad day and just wanna laugh a little" go-to. A hilarious and fashionable mama of four (soon to be five) littles, she posts great giveaways, awesome outfits, and is always good for a chuckle. Seriously. So funny. Like Mother, Like Daughter: If you're looking to step right into someone's living room, this is the blog for you. These ladies (a mom and her two grown daughters) write realistically and practically, and take beautiful pictures of the joys of life. Good recipes, great tips on womanhood and family life, all served up warmly and with a good sense of humor. Every Bitter Thing Is Sweet: Powerful stuff. I've talked about this blog before- mostly because Sara's Adorations are so great (and beautiful! See Instagram). Sara speaks a lot of truth. A Holy Experience: Ann Voskamp's blog. I've written about Ann before, but I didn't start reading the blog until my small group went through her book. Her blog is pretty great, too. We Are THAT Family: Kristen writes great stuff- real, gritty, and full of grace. Her blog spans lots of topics, from marriage to parenting to making a global difference. Comment on their posts- if you like something they had to say, tell them so! I've also sent an e-mail to a couple of bloggers to say thank you... and they responded! It was like talking to a celebrity! But I know that for many bloggers, the critics' words are loud, and if you can tell them that they're making a difference, it could really make their day. The more eyes on a post, the better for the blogger. Lots of bloggers (well, the smaller ones, anyway) spend hours and hours crafting meaningful content and putting it out there... for all of $0.03 a month. If you read something that makes a difference to you, share it! Some blogs include ads or affiliates as part of their website, or write reviews for products or services. 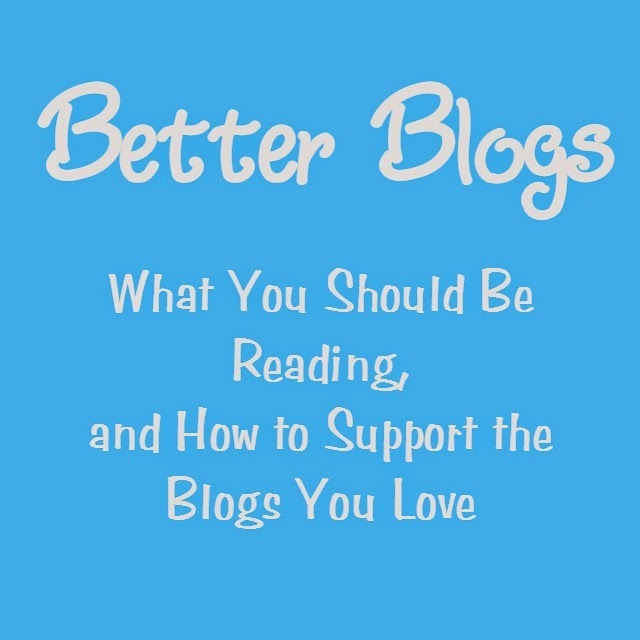 By visiting the companies or people sponsoring the blog, you're encouraging the company to keep paying the blogger, and a lot of bloggers wouldn't be able to keep writing if they weren't sponsored. That little "Follow By E-mail" thing on so many blogs? Give it a shot. Did you know that you might not be seeing everything that your favorite blogger puts out there? Facebook is reducing its reach (trying to encourage bloggers and other businesses to pay for their advertising, which makes sense)- but that means that even if a blogger puts up a Facebook link, you might not see it. Having the blogger's posts sent right to your e-mail inbox is a great way to make sure that you're seeing all their stuff. I'm right there with you- I feel so much happier about the world after reading some of my favorite blogs! One thing that's really helped with e-mail for me is Gmail's new(ish) tabs- I put all my blog subscriptions in my "Social" tab, so I can get to them later and deal with the more immediate e-mails first. Thanks for stopping by, Tarissa!